25th – 31st December. A bottle is seen on a parched ground at Guadalteba reservoir during a strong drought in Ardales, near Malaga, southern Spain. Photo credit: Reuters / Jon Nazca. 18th – 24th December. Polluted water in the river Ganges seen in Kanpur, India. Photo credit: Reuters / Danish Siddiqui. 11th – 17th December. A general view of the dried up Theewaterskloof dam near Cape Town, South Africa. The dam supplies most of the city ‘s potable water. Photo credit: Reuters / Mike Hutchings. 4th – 10th December. This Christmas our editor urges you to reconnect with nature. Photo credit: invisiblepower from Pexels. 27th November – 3rd December. Why are tech giants not doing more to tackle climate denial? Photo credit: Duncan Hull via Flickr. 20th – 26th November. The Vegan Society’s Louise Davies argues that going vegan is crucial in order to tackle climate change. 13th – 19th November. In his keynote speech at the Web Summit, Al Gore appealed to the tech community to join the climate fight. Photo credit: Stephen McCarthy / Web Summit. 6th – 12th November. The concentration of carbon in the atmosphere have hit the highest level ever during human habitation on Earth. 30th October – 5th November. Thanks to decentralised energy storage solutions we are getting closer to the day when renewables can stand on their own feet. Photo credit: Tesla. 23rd – 29th October. Beef cattle contribute to a variety of environmental problems, ranging from climate change to conversion of native habitat to pasture, to pollution of aquifers with waste. Photo credit: Jeheme via Visualhunt / CC BY-NC-ND. 16th – 22nd October. Lawrence Orsini speaking about blockchain and solar at the Wired Energy conference in London, UK. Photo credit: Wired UK. 9th – 15th October. The UK’s National Physical Laboratory hosts London’s first hydrogen fuel cell charging station. 02nd – 8th October. The Vegan Society says there’s huge carbon savings to be made by switching to a vegan diet. Photo credit: Ula Zarosa via Flickr. 25th September – 1st October. Climate-fueled super-storms like Hurricane Harvey and Irma are not going away. Quite the contrary. Photo credit: NASA Worldview. 18th – 24th September. The head of Government in Germany will, again, for the next four years be Angela Merkel after she and her party, the Christian Democrats, cruised to victory in the German general election. Reuters / Fabrizio Bensch. 11th – 17th September. People struggling to walk along a street in South Beach in Miami Beach during Hurricane Irma. Photo credit: Reuters / Carlos Barria. 4th – 10th September. Hurricane Harvey seen from the International Space Station on August 28. Photo credit: NASA Goddard Space Flight Center via Flickr. 28th August – 3rd September. US President Donald Trump as Hurricane Harvey unfolds. Photo credit: Reuters / Tony Tharakan. 21st – 27th August. The Bank of England’s new polymer £10 note will have a significantly lower carbon footprint than its predecessor. Photo credit: Bank of England via Flickr. 14th – 20th August. Over the last 50 years, Alaska’s Sawyer Glacier has retreated around 2-3 kilometers. Photo credit: Ian D. Keating via Flickr. 7th – 13th August. We’re only seven months into the year, and we have already broken the Earth’s resource budget. 31st July – 6th August. A Greek power plant. Photo credit: A. Christofilopoulos. 24th – 30th July. Smoke emitted from a hotel in Debuche as the sun sets over Mount Everest. Recent studies show that black carbon from such smoke is causing faster retreat of the glaciers in Himalaya Region. Photo credit: Nabin Baral. 17th – 23rd of July. Tour de France promotes nature and the environment but must go much further. Photo credit: EPA / Ian Langsdon. 10th – 16th of July. London boroughs are trialing an innovative smart bench, powered by solar power. Photo credit: Strawberry Energy. 3rd – 9th of July. New research explores the link between deforestation and malaria. Photo credit: Shutterstock / Dudarev Mikhail. 26th June – 02nd July. A 8MW Vestas turbine stands in front of the smaller 3.6MW models at the Burbo Bank Extension offshore wind farm. In May, the first offshore wind power project to use Vestas giant new 8MW wind turbine started to generate power. Photo credit: DONG Energy. 19-25th of June. More than 1,000 firefighters struggled to contain intense forest fires which engulfed a large part of Portugal in flames last week. Described as ‘the worst national human tragedy in living memory’ by the country’s prime minister Antonio Costa. The fire took several days to control, with at least 64 people losing their lives. The forest fire is here seen near Bouca in central Portugal. Photo Credit: Reuters / Rafael Marchante. 12th-18th of June. Palm Fruit in Sumatra. 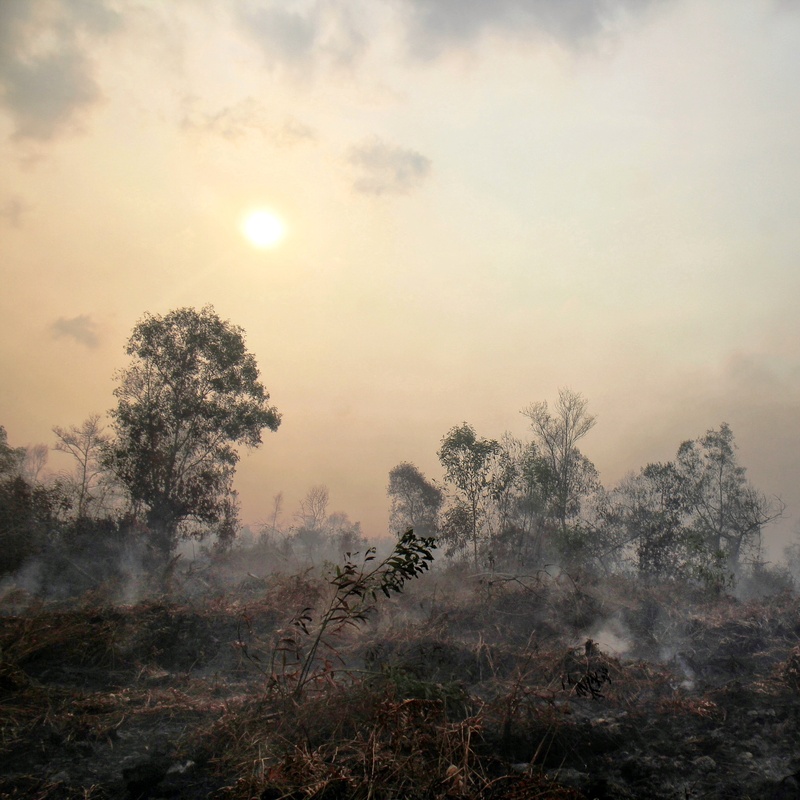 Oil palm plantations have expanded rapidly over the past two decades in Indonesia, clearing large swathes of natural forest and critical peatland areas. Photo credit: John Novis. 5th – 11th of June. President Trump refers to amounts of temperature change as he announces his decision that the United States will withdraw from the landmark Paris Climate Agreement, in the Rose Garden of the White House. REUTERS/Kevin Lamarque. 29th of May – 04th of June. As Trump this week distanced himself further from global cooperation on fighting climate change, expect the US and global climate movement to mobilise even further. Just over a month ago 200,000 protesters took to the streets of Washington to protest his attack on Obama’s climate policies. Photo credit: majunznk via Flickr. 22nd -28th of May. As the Arctic ice continues to melt, we must approach the challenge with some hope. Photo credit: NASA / Kathryn Hansen. 15th-21st of May. Does UK Prime Minister Theresa May understand the scale of London’s air pollution problem? Photo shows high air pollution over London in 2014. Photo credit: David Holt via Flickr. 8th-14th of May. The next President of France, Emmanuel Macron, waves from his car as he leaves his home during the second round of the election, in Paris, France. Photo credit: Reuters / Jean-Paul Pelissier. 1st-7th of May. The Yamal Peninsula in Russia could be a heaven for oil and gas companies. Photo credit: Gazprom.com. 24th – 30th April. Oil palm workers build a dam at the Dosan palm plantation. An innovative, independent small-holder approach to palm oil production has delivered social and economic benefits and helped protect the remaining forest. The Dosan community has committed to protecting its forests and moving to improved environmental management practices that include zero burning, no herbicide use and improved water management to maintain the peatland water system. Photo credit: John Novis. 17th – 23rd of April. Underwater footage of the bleaching at the Mission Beach Reefs. Photo credit: Bette Willis. 10th – 16th of April. From ‘Book review: Images From a Warming Planet. Where has all the water gone. Lake Hume is the largest reservoir in Australia and was set up to provide irrigation water for farms further down the Murray Basin and drinking water for Adelaide. On the day this photograph was taken it was at 19.6% capacity. By the end of the summer of 2009 it dropped to 2.1 % capacity. Such impacts of the drought are likely to worsen as a result of climate change. The last time the water was anywhere near this road bridge was 10 years ago, rendering this no fishing sign, somewhat redundant. Photo credit Ashley Cooper.